Pope Benedict XVI surprised everyone by his very unusual decision to resign from the papacy. And not surprisingly, the world reacted with stories about reportedly true signs that indicate the world is coming to an end — or some dire iteration of that. What have you heard? What are you wondering might be true? What should we believe as Catholics? Is Pope Benedict XVI the “Gloria Olivae” from the Prophecy of Malachy? Saint Malachy has been attributed to writing a set of prophesies regarding the succession of popes beginning with Innocent II, who became pontiff in 1140. According to his predictions, the line of popes will end after the papacy of Benedict XVI. And then the world will end. My personal policy regarding anything about the end of the world is to assume that we misunderstand it. Throughout the centuries, since the first generation of Apostles, there have been countless wrong guesses and wrong interpretations of true prophecies and many false prophecies and much hysteria. We must always be ready for the Second Coming of Christ but without causing fear and hysteria and without assuming it will happen in our lifetimes. The Book of Revelations is often misquoted and misunderstood for the sake of “prophetic” end-of-world discussions. (See The Book of Revelation: Understanding Its Message of Encouragement.) We cannot trust what we read on the Internet, more so than we cannot trust every book just because it’s been published, unless their sources are highly reputable, such as the Vatican and EWTN. Reputable scholars have researched the Prophecy of Malachy and dated it to the 16th century, because there is no mention of it prior to that time. Those who want to believe in the prophecy explain this discrepancy by saying that it was kept hidden for centuries. However, the prophecies, which consist of enigmatical oracles taken from scriptures, supposedly referring to each pope from Celestine to the end of the world, rely on symbolic terms that can be interpreted this way or that, made to fit every pope if we try hard enough. Most significantly, the symbols used to identify the “future” popes are highly accurate and on-target until 1590, but they’re extremely vague afterward, leading to the conclusion that it’s a 16th forgery. Researchers further concluded that they were invented at the request of a certain cardinal who wished to have his coat-of-arms match one mentioned in a prophecy in order to get elected pope. Although he was not elected, the papal prophecies attracted much interest and soon became widely read, passed along to modern times with the prophecies of Nostradamus, who was definitely not Christian and is not to be believed. This does not mean that we should automatically rule out the Malachy prophecies. A faithful Catholic is free to accept or reject the Prophecy of St. Malachy, as it is a matter of private, not public, revelation. We should not use the prophecy, however, to start thinking that the end of the world is soon. Not only is this extremely unwise — Jesus Himself cautioned against it — but countless testimonies of Saints over many centuries indicate that an era of peace will come before the end of the world — and we’ve not seen this yet! 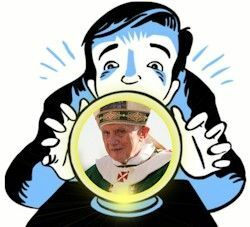 Even if Malachy’s Prophecy is genuine, there is no reason to assume that we’re only one pope away from the end of the world. The Prophecy did not spell out that there would be no popes between De labore Solis (interpreted as John Paul II) and Gloria olivae (if Malachy listed 111 as some say he did) or between Gloria olivae and Petrus Romanus (if he listed 112 as the Catholic Encyclopedia says he did). The Prophecy does not rule out imagining as many popes as we want — and if it turns out that there are 1,112 popes before Christ returns, people will still be able to say that St. Malachy was uncannily correct. We need to keep our eyes on Jesus, live today as if it’s our last day on earth, and make sure that we don’t live in fear, nor a distracting fascination with end-times, nor spread it. Can We Actually Predict the End of the World? I’m often asked for my opinion about modern-day mystics, inner-locutionaries and visionaries, i.e., people who claim to be getting messages from Jesus or His Blessed Mother, Mary. The questions come especially about the ones who warn that Americans are soon going to pay for their sinfulness, or that the anti-Christ is here or is coming soon, or that time is short and disaster is looming for the entire society or world. 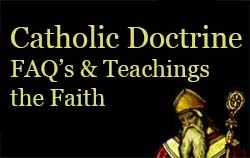 My answer comes not from any supernatural, direct revelations, but from theCatechism of the Catholic Church, study of scripture (all of it, understood as a whole, instead of pulling phrases and quotes out of context), Pope John Paul the Great, psychology, sociology, and the historical view of the Church and of society. The Church officially warns that any message that contradicts scripture is to be disbelieved, and that even when a visionary or inner-locutionary reveals messages that are completely orthodox theologically, this by itself is not proof of a supernatural event. If you ask me if I think the Second Coming of Jesus is going to occur anytime soon, I’d reply: “No, I don’t think so, but we must help the world prepare as if it will happen tomorrow. We must all evangelize with every effort, so that we are not accountable for any lost souls.” People have been sure that the Second Coming was going to happen soon, for 2000 years. Jesus said that only the Father knows the actual hour, and anyone who claims it’s been revealed to them is probably wrong, because the Father did not reveal it even to his own Son. After reading what the Catechism says on the topic, I believe that before the Second Coming can happen, the Body of Christ on earth (i.e., the community of Christians who are his hands and feet and voice) must first fulfill the mission that Jesus gave us on the day of his Ascension to heaven. We who are now the Body of Christ on earth have to become much more proactive in evangelization, doing the ministry that Jesus started 2000 years ago, converting the world the way he did, suffering the persecution that this causes, and being crucified because of our love for sinners. We’re a lot closer to the fulfillment of this mission, more than at any other time in history, thanks to internet communication and the new springtime of evangelization that John Paul the Great initiated. To move forward, as a body, we have to become unified in loving the evil-doers, reaching out to them rather than hating them and wishing that Jesus would hurry up and punish them. For the full article, please go to my WordByte entitled The Second Coming of Christ. or Any Unusual Natural Event a Sign of the End? 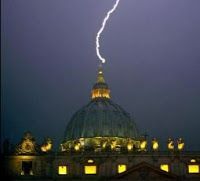 How many times has the lightning rod on St. Peter’s Basilica at the Vatican been hit beforethe Pope resigned? I’m sure the day of his resignation was not the first time. So, was this just a normal, natural event, or was it a sign from God? And what about the meteor that hit Russia soon after? The meteor’s size is thought to be about 55 feet (17 m) wide, with the power of the blast estimated to be 500 kilotons, according to NASA officials. Its sonic shock wave damaged buildings and injured over 1,200 people. The damage is estimated at 1bn roubles ($33 million USD). It’s the largest to hit the Earth in more than a century. So, was this just a normal, natural, albeit infrequent event, or was it a sign from God that the end is near? After Hurricane Katrina devastated New Orleans in 2005, there was plenty of talk about it being a “chastisement” or punishment from God. I didn’t hear so much of that about Superstorm Sandy in 2012; maybe we’re getting used to the idea that global climate change has something to do with the increase of terrible storms. Frankly, I wish people would talk more about that than chastisements. It could be more productive. 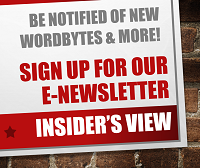 After Katrina, I wrote the Good News WordByte: Are Natural Disasters Really Chastisements? 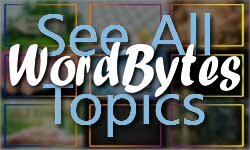 End-of-world discussions lead to the topic of the predictions in the Book of Revelation. Perhaps one of the reasons that the last book of the Bible is so mysterious, so confusing, or so fearsome, is that we don’t look at it as a loving, personal message from God. We focus on its meaning for the world and try to interpret it as a warning about a destructive and inevitable end. We search for clues about the timing of the Anti-Christ and the Second Coming of Jesus, while forgetting that the Word of God always has multiple levels of meaning, and that God always wants to speak to us individually in every scripture. He wants His Word to affect our lives in the here and now. He wants His Word to help us grow closer to Him. He wants His Word to challenge us to more lovingly serve our brothers and sisters. And He speaks to us through all scripture ~ including the Book of Revelation ~ to make a difference in the only moment we’ve got: The Now Moment. For more on this, go to this WordByte: wordbytes.org/bible-study-revelation. What Should Be Our Reaction to End of the World Stuff? Whether we believe the world is coming to an end or not, certainly we should be praying for the conversion of the world. On our Good News Ministries website, I’ve posted a Rosary for this: The Mysteries of Light for the conversion of the world. Terry Modica replied: “In Matthew 24:36, Jesus said, ‘No one knows about that day or hour, not even the angels in heaven, nor the Son, but only the Father.’ The way I see it, Fatima was not meant to be a prediction of WHEN the end would come, nor has any other genuine prophet. In Judeo-Christian language, a prophet is not a predicter of the future but a messenger of God. What is God trying to say? First, that we should be ready at any time for the Second Coming of Christ, and secondly that evil will be defeated. This is meant for us today, not just for some day in the future when the world ends. Jesus comes to us again and again every day, and we are all together the Body of Christ with the power to defeat evil today. THIS should be our focus. I believe this is the focus God wants from us. Terry Modica replied: “You are correct, Desmond, of course Jesus is God. Once he ascended to heaven to “sit at the right hand of the Father”, we can safely say he entered into the fullness of the conscious omniscience of God and knows when the end will come. But we can also safely that in heaven (aka eternity) there is no clock or calendar nor measurement of time as we know it here on earth. In eternity, all is “now”; God is omnipresent in all of time, and God (Father, Son and Holy Spirit) dwell in what is our future as well as the past and what the present moment that we call “now”. The mysteries of time from the point of view of eternity are beyond our current ability to understand. They mysteries of the Holy Trinity are also beyond our ability to understand fully. Therefore, I will never trust any predictions that give us an expectation of WHEN God will do anything! Especially anything regarding the End Times and the Second Coming of Christ. And I encourage others not to look at the WHEN but rather at the Lord Jesus Christ himself and what he is doing in our lives NOW and what he is calling us to do TODAY to help drive evil out of the world (rather than wait for HIM to drive it out by his Second Coming).